Should you choose Hybrids, Heirlooms or Open Pollinated? It can be a little confusing understanding not only which type of plants you should be choosing, but what is the difference. Depending on your climate, site, maintenance needs and desired results, you may choose an heirloom over a hybrid, or hybrid over an open pollinated plant. Once you understand the differences you can make a choice that suits your needs. First though, I would like to make it clear that a hybrid is NOT genetically modified. Creating hybrids is the careful and specific pollination between two plant species, which happens haphazardly in nature all the time. Hybrid plants are developed by the simple human intervention of hand pollinating two compatible plant varieties with the hope that the resulting plant will acquire specific desirable characteristics. Genetic Modification is accomplished by using technology to manipulate genes of several completely unrelated types of organisms that would never cross naturally to create desirable, bot unnatural traits. So, you can feel comfortable choosing hybrids, open pollinated plants or heirlooms for any situation in your gardens. Heirloom plants are simply plants that have been grown from saved seeds for generations. The plants are open pollinated and the seeds are saved each year to be grown the following season. Many gardeners who grow heirlooms segregate the heirlooms from other plants to minimize, if not prevent, cross pollination. These open pollinated plants may be cross pollinated naturally and can potentially no longer produce the exact original heirloom. That does not make a “bad” plant, simply different. It may not possess the exact characteristics that were desirable in the original heirloom but in general do not produce an offspring true to the parent. Ideally heirloom varieties are protected from cross pollination, but that can be difficult for a home gardener to accomplish. Many gardeners cover blossoms of heirloom vegetables with a mesh bag to prevent cross pollination. To grow and protect prized heirlooms you will need to research methods. However there are seed companies that take great care to allow open pollination without cross pollinating, most notably Seed Savers Exchange of Decorah Iowa. Typically only the “best” plants become heirlooms. Gardeners who have grown a plant that is especially tasty, or hardy for the region, or naturally resistant to the diseases or insects of the region, have historically made a point to save the seeds to grow year after year. Those seeds are often passed on from generation to generation. Heirloom plants are often quite unique compared to hybrids that have been carefully cross pollinated to produce mass appeal. 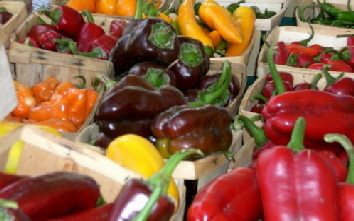 For example heirloom tomatoes may be red, or yellow, or pink or purple, or produce a unique flavor or texture. Hybrid tomatoes may, for example, be cross pollinated to produce the mass appeal of perfectly red or perfectly round tomatoes. Pretty in the garden or grocery store, but not necessarily the flavor you are looking for. Some hybrid tomatoes are of course bred specifically for their unique flavor. Hybrid plants are created when two parent plants, often of the same species, are cross pollinated in an environment that controls cross pollination. The controlled environment ensures that only the specific pollination desired occurs, and seeds of the female are collected. When the two parents used are pure, the offspring is called an F1 hybrid. The carefully collected seeds are used to grow the F1 plants. Seeds that are eventually produced by the F1 plants will not produce another true F1. Although they will generally germinated, the offspring produced are not uniform and often produce one of the wild parent plants. The only way to grow a true F1 hybrid is to purchase the controlled seed from the seed company, or purchase the nursery grown plants. Successful hybrid plants will have the best characteristics of the parents, and the least desirable characteristics are not present. Hybrid flowers and produce may be highly disease resistant, more vigorous than the parents, more intense color, more uniform and pleasing growth structure, increased yields, or some combination of the best traits. Of course if a hybrid is highly resistant to a disease that is not present in your region, that is not an advantage in your situation. So do pay attention to the improved characteristics to determine the real value in your gardens. Naturally pollinated plants will produce offspring that are if not identical, nearly indistinguishabl e from the parents. Not all plants are able to produce uniform offspring when open pollinated. Some plants need to grown isolated or separated from other varieties to ensure they are not cross pollinated, thereby producing a natural hybrid instead, or eventually causing enough changes to the plants produced over time that rogues are produced. These rogues should be removed and not perpetuated with the open pollination crop. Plant seeds that are called open pollinated must be able to produce stable offspring. Varieties that have adapted and developed unique characteristics are often perpetuated by local gardeners with open pollination and seed collection. Some of these open pollinated plants are perpetuated long enough to become heirlooms. Open pollinated vegetables will often have superior flavor compared to hybrids developed for large growers. Even organic gardeners can feel comfortable selecting any of these seed or plant types. Each gardener needs to compare the advantages and disadvantages of the plants to select what is best suited to their own gardens and personal preferences.